Our offices will be closed over the Christmas period from the 24th December to the 2nd January. We will be back in the New Year on Tuesday 3rd January 2012. It Time You Joined the Zombie Revolution! With a new report from 24/7 Wall St. stating that Zombies are worth over $5 billion to the economy, there couldn’t be a better time to join the Extreme Zombie revolution! Zombies, commonly followed by cult enthusiasts and horror fanatics, have slowly made their way into popular culture and have become highly grossing subjects. On top of box office film tickets, Zombie sales have soared on all video games, DVDs, novels, Halloween costumes, merchandise, conventions as well as Zombie art. With Zombies on the rise, we can only expect more good things to come for our own ghoulish property, Extreme Zombies! 2011 already brought through some fantastic deals for the property including apparel selling through all European branches of C&A, as well as new items such as posters, mobile and electrical skins, stationery sets and gaming accessories. 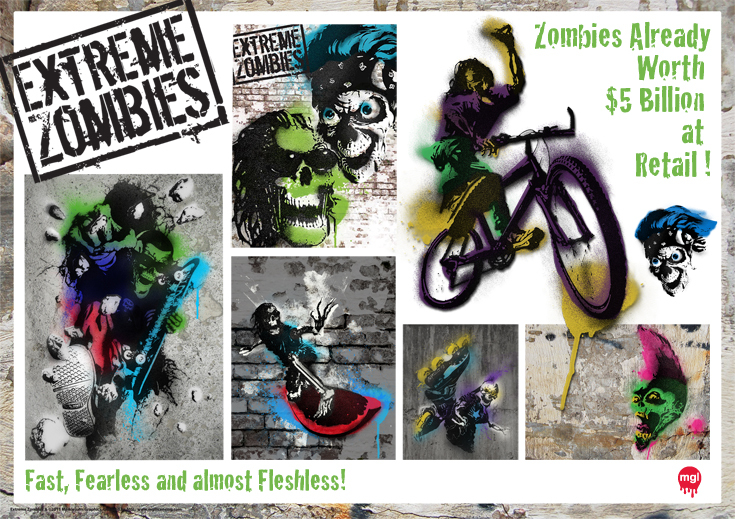 The Extreme Zombies’ edgy spray art offering and sports appeal makes this the ideal property for all 8+ boys. In the past year, Mexico City has seen thousands of self-proclaimed Zombie followers organise a ‘Zombie Walk’ in a bid to beat a world record. Virgin Trains and Phones 4 U have both used these ghoulish monsters in their recent advertising campaigns. Even the successful vampire TV series, True Blood, saw the last season end with one of its characters stating that ‘Zombies are the new Vampires’. With more activity, merchandising and Hollywood releases set for next year (World War Z starring Brad Pitt and the new animated film ParaNorman amongst others) 24/7 Wall St. expects the earnings to get even higher by the end of 2012! We are looking for more partners in all product areas to sign on the Extreme Zombie property. Sources: 24/7 Wall St October 2011. The Daily Mail November 2011. Screenrant August 2011. Virgin Trains. Phones4U.